Well, we finally got some racing and it was completely different than all of us thought. At least upwind. The start was exciting...we had a dial up and a penalty! We had it all! I have to say that was worth waiting for. These boats are spectacular! After dial up and skillfully controlling much of the prestart, BMW Oracle looked like they got stuck head to wind with 30 seconds to go while Alinghi did a nice job to escape and win the start by more than a minute. From there the two boats stayed on the port tack and were much more similar in speed than predicted. It looked to me like BMW Oracle had a bit of both....closer and faster.... upwind. The Americans rounded the top mark in what looked like 8 knots of wind with a 3:21 lead. I think everyone was waiting for Alinghi to come roaring up from behind but the opposite happened and BMW stretched out to a comfortable win for race 1. Alinghi's back is against the wall now. They are slower in "their" conditions and on the windward leeward course. On Sunday, the boats will race the triangle course which will be more to the Americans liking than today's course. So it could be a pretty sweet Valentines Day for Mr. Ellison. But as they say, it is never over 'til it's over and these boats are at the cutting edge of technology. Reliability is something the Americans will be increasing anyway they can in the next 40 hours. 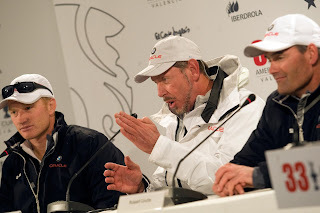 I am off to Dubai for some RC 44 sailing with Artemis and Katusha and my Eurosport buddies are off to Vancouver. Two big Sundays in a row this February...Super Bowl the America's Cup.